​Please read the information below to learn more about the test, view example reports, see what is included with the test results and to view how much hair is needed for sampling. 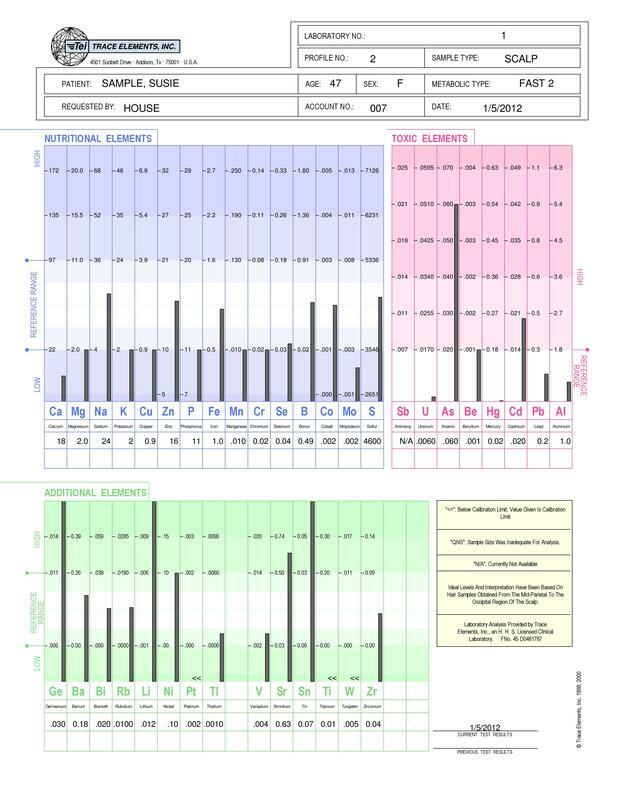 ​Results graph from Trace Elements Inc giving an accurate analysis of 37 metals stored in your hair sample. Trace Elements Inc are recognised as the world's leading providing of hair mineral analysis testing. Comprehensive interpretation and analysis report of results graph (simple to understand). This is a unique report done by mindovermetal. At mindovermetal we look at specific markers in the reports for adrenal insufficiency (adrenal fatigue) and direct or hidden copper toxicity. It is important to establish whether or not any excess copper is hidden in body tissue, several markers are analysed by mindovermetal which are indicative of hidden copper toxicity. A number of markers are also analysed which are indicative of adrenal insufficiency. The adrenal insufficiency and copper toxicity (hidden or direct) markers is a unique element to the reports that mindovermetal provides. 'Hair mineral testing info' document included. Understand the test itself and what different readings/markers can demonstrate. This is a unique info document done by mindovermetal which provides insightful information into what the hair mineral test actually is and what it is demonstrating. 'How to reduce and cope with stress' document provided with all hair mineral test results. Helpful advice from mindovermetal which can help with daily stress issues. 'Rebalancing the body' document provided with all hair mineral test results. Information about rebalancing mineral levels/ratios and balancing overall body chemistry. At mindovermetal we focus on what the actual mineral levels indicate if they fall below or above the reference ranges, they can sometimes be different to mineral chemistry elsewhere in the body, this is an important aspect. We also focus on why the minerals have depleted or become excessive in body tissue and what to do about it. Adrenal fatigue, copper toxicity and toxic metal treatment programmes by mindovermetal provided at no extra cost if results come back as positive. One-to-one support provided via email at no extra cost. Results will be emailed to you and the turnaround time once it has reached the location in the UK (not from when it reaches the USA) is 7 - 10 working days. You will receive a report with your results graph which analyses your readings and markers. You also receive dietary/supplement advice and information on how to rebalance mineral chemistry. Information on ways to cope with and deal with stress is also provided. If you test positive for copper toxicity, adrenal fatigue or toxic metal accumulation, then you will receive the appropriate treatment programme. ​Below you will see an example of what a hair mineral test graph looks like. This is the graph that is produced by Trace Elements Inc from the hair that you submit. The graph shows 15 nutrient minerals, 14 additional minerals, 8 toxic metals, 7 significant minerals, 9 toxic ratios and 11 additional mineral ratios. With antimony it says N/A, this is because it is difficult to stabilise and reproduce, the laboratory charges extra for this reading. If you would like antimony to be included in your report then please contact mindovermetal for further details. Click to enlarge or click below to download. Please note: If you would like to see an analysis and interpretation report example of a results graph then please contact mindovermetal to arrange this. Nutritional elements analysed - Boron, Copper, Calcium, Chromium, Cobalt, Iron, Molybdenum, Manganese, Magnesium, Potassium, Phosphorus, Sodium, Selenium, Sulfur, Zinc. Additional elements analysed - ​Barium, Bismuth, Germanium, Lithium, Nickel, Platinum, Rubidium, Strontium, Tin, Titanium, Tungsten, Thallium, Vanadium, Zirconium. Toxic elements analysed - Aluminium, Arsenic, Antimony*(additional payment required), Beryllium, Cadmium, Lead, Mercury, Uranium. ​Significant ratios analysed - Calcium/Phosphorous (Ca/P) ratio, Sodium/Potassium (Na/K) ratio, Calcium/Potassium (Ca/K) ratio, Zinc/Copper (Zn/Cu) ratio, Sodium/Magnesium (Na/Mg) ratio, Calcium/Magnesium (Ca/Mg) ratio, Iron/Copper (Fe/Cu) ratio. Toxic ratios analysed - Calcium/Lead (Ca/Pb) ratio, Iron/Lead (Fe/Pb) ratio, Iron/Mercury (Fe/Hg) ratio, Selenium/Mercury (Se/Hg) ratio, Zinc/Cadmium (Zn/Cd) ratio, Zinc/Mercury (Zn/Hg) ratio, Sulfur/Mercury (S/Hg) ratio, Sulfur/Cadmium (S/Cd) ratio, Sulfur/Lead (S/Pb) ratio. 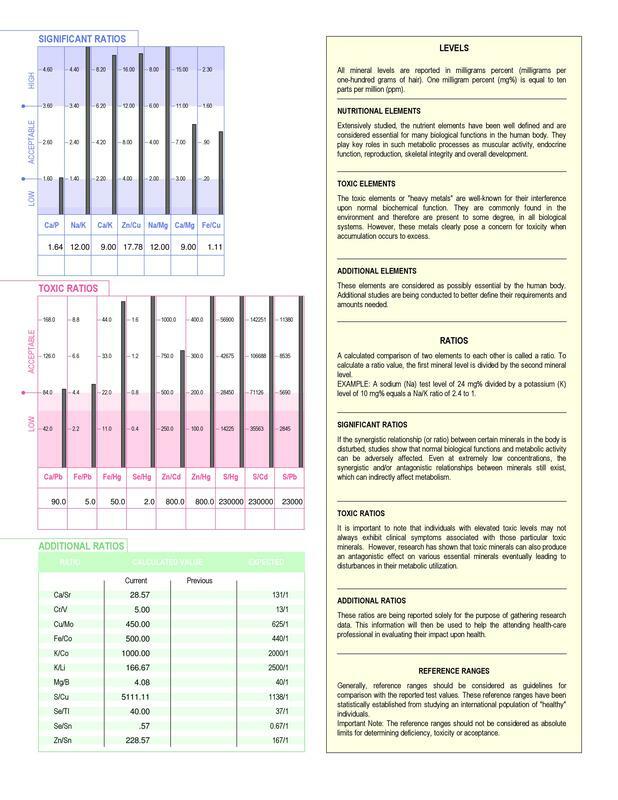 Additional ratios analysed - Calcium/Strontium (Ca/Sr) ratio, Chromium/Vanadium (Cr/V) ratio, Copper/Molybdenum (Cu/Mo) ratio, Iron/Cobalt (Fe/Co) ratio, Potassium/Cobalt (K/Co) ratio, Potassium/Lithium (K/Li) ratio, Magnesium/Boron (Mg/B) ratio, Sulfur/Copper (S/Cu) ratio, Selenium/Thallium (Se/TI) ratio, Selenium/Tin (Se/Sn) ratio, Zinc/Tin (Zn/Sn) ratio. ​Please note: The antimony reading is N/A, this is because it is difficult to stabilize and reproduce, the laboratory charges extra for this reading. If you would like antimony to be included in your report then please contact mindovermetal for further details. For best possible results the hair should not be bleached, permed or professionally dyed. Standard home hair dye/colour products are acceptable and will not affect result readings. For hair that has been bleached or professionally dyed, the new natural roots of hair that come through can be used as long as it is at least an inch and a half in length. Use of most shampoos, rinses and conditioners do not affect test results but only shampoo can be used to wash the hair on the day of sample collection. There are certain shampoos which can affect test results though and will need to be avoided for a certain period (1 week or so), these are stated in the sample collection guidelines document that is sent out when the hair test is ordered. The sample should be taken between 4 and 24 hours after washing the hair. No hair products can be used after washing it and the hair should be completely dry when collecting the sample. ​The primary choice of location for hair sampling should be the neck and crown area of the head. If you do not have any hair in this area or your hair is too short for sampling in this area then you can use hair at the front of the head (if hair there also) or you can use underarm hair, facial hair or other bodily hair. Nutrient minerals and toxic metals are contained in hair all across the body. It is not possible to mix the hair samples from different locations on the body though. You can only take the hair samples from one area of the body, i.e. do not mix head hair with facial hair. If completely no hair is available then nail clippings can be tested. These alternative tissue samples may not be as reliable as head hair and may not always provide nutrient mineral data, but they will monitor toxic mineral levels. Several small samples can be taken and put together until enough hair is needed. This will achieve a more accurate and representative sample. It will also help in leaving no bald patches, especially those with shorter hair. Head and body hair cannot be mixed together for sampling. For long hair, the hair can be pulled forward from the back and pinned or clipped so that hair can be taken from underneath nearest the scalp. This will also help with disguising any possible bald patches. The hair needs to be cut as nearest to the scalp or body as possible and you only use the first 3cm (1.5 inches) of hair for sampling. For short hair less than 3cm in length, the entire length of the cut hair is used, so it is fine if your hair is less than 3cm inches in length on your head or other areas of the body. For hair longer than 3cm, the hair is cut nearest from the scalp as possible and the hair above 3cm is discarded. Equipment needed - a standard comb, stainless steel pair of scissors and a pin or clip for long hair. Only stainless steel type scissors can be used and not an electric type razor as the metal particles from the blades may get mixed in with the hair. Someone will need to cut the sample for you if the hair is being taken from the head area. If you are taking the hair sample not from the head then you can collect the sample yourself from other areas of the body. Once you have ordered the test you will receive a sample guidelines document and the submittal form (via email) showing you how to collect the sample, there is no test kit delivered to your address. You will need to fill up a box of hair which will be drawn on a piece of paper measuring 5cm in length and 2.5cm in width. The readings on a hair mineral analysis test represent mineral and toxic metal readings no matter how they were achieved - environment, stress, physical and emotional health and any food or supplements you are consuming. The readings are what they are, no matter how they got that way. ​What is hair mineral testing? How is a hair mineral test performed? A small amount of your hair is needed to send off to the laboratory in Dallas Texas USA where Trace Elements Inc is based. The hair sample is sent primarily to a location in the UK and then forwarded to the lab in the USA (postage costs to the USA already covered by us). The hair is then tested for its mineral and toxic metal storage levels. The laboratory uses the most advanced and sophisticated instrumentation available today - the Perkin Elmer 9000 ICP Mass Spectrometer. The machine assesses mineral levels and the report findings are in mg% (milligrammes per 100 grammes of hair). A hair tissue mineral analysis is considered a standard test used around the world for the biological monitoring of trace elements and toxic metals in humans and animal species. Taking the sample is non-invasive and pain-free, anyone can do it. Mindovermetal Ltd affiliates with a laboratory in the USA because hair mineral testing is rarely practised in laboratories in the UK and Europe. What can hair mineral testing reveal? A picture of mineral chemistry of the last 3 months. Toxic metal detection - toxic metals are unavoidable in the environment we live in, but we also consume toxic metals through certain food and drink sources. Frequent stress and adrenal insufficiency also makes us more susceptible to toxic metal build up and impairs the detoxification process of toxic metals. For more information on toxic metals please click here. Copper toxicity (direct or hidden) - copper is the most common mineral to be in excess because of the way it builds up in the body from chronic stress. Copper is an essential mineral, but because it is a heavy nutrient metal, it is toxic when there are excessive amounts in the body. This mineral imbalance is associated with many mental health symptoms and conditions. Copper toxicity is a big hidden problem in the world today. For more information on copper toxicity please click here. Mineral deficiencies/excesses in body tissue - mineral excesses can be just as bad as having a deficiency. Mineral excesses mainly happen from frequent mental and physical stress on the body, certain minerals such as copper and calcium rise in body tissue when the body is put under stress for long enough. Repetitive stress can also cause minerals to deplete from the body such as magnesium and zinc. Adrenal fatigue - adrenal fatigue is a huge problem that affects people without them knowing. The adrenals are the stress response organs and modern day humans experience a lot of repetitive daily stress which has a big impact on the adrenals. Adrenal fatigue is associated with many mental and physical health conditions. For more information on adrenal fatigue please click here. Significant mineral ratios (if mineral relationships are balanced or unbalanced). Toxic ratios (the relationship between certain minerals and certain toxic metals). Suggestive markers of - thyroid function, glucose metabolism and sensitivity, immune system activity, liver and kidney stress, autonomic state (sympathetic dominant or unhealthy parasympathetic dominant), protein synthesis, digestion ability and inflammation/inflammatory responses. Body stress stage - alarm, resistance or exhaustion. Oxidation rate (rate at which the body burns food). Why undergo a hair mineral test? The test can reveal toxic metal levels and mineral imbalances/relationships in body tissue which is very important information when it comes to your mental and physical health. The test can potentially reveal the underlying cause of your current mental and physical health symptoms and conditions. Mineral imbalances and toxic metals can have a profound effect on brain chemistry and can have a big impact on the body physically resulting in a lot of symptoms. Hair mineral testing can play a key role in the correction of body chemistry because the test is serving as a mineral blueprint of one’s biochemistry. Hair mineral testing is measuring mineral storage levels over a long period of time which is a powerful tool for mineral level representation in body tissue. A hair mineral test is more stable and reliable than a blood test. Blood tests are subject to variations on a daily and sometimes hourly basis. Hair provides an average reading of the past three months.